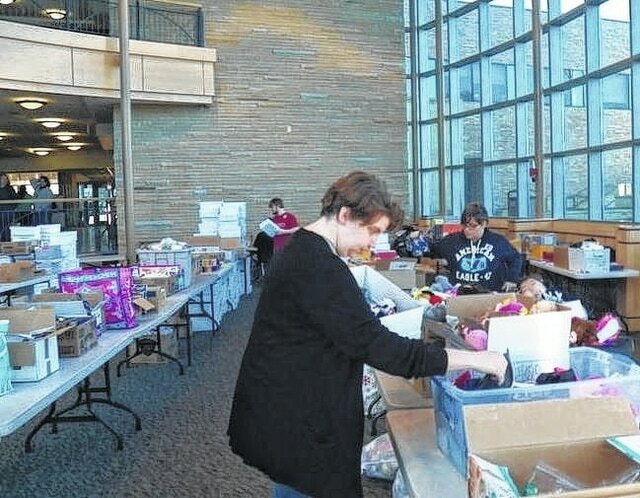 A group of compassionate students and faculty at Shawnee State University (SSU), who call themselves members of the Operation Christmas Child at SSU, is currently planning on getting ahead of the game this year by kick-starting fund-raising attempts this week. The group raises money and hosts toy drives throughout the year that goes towards the packing of small boxes that will be given to children in third-world countries for Christmas. These boxes contain simple and small items that these children don’t often receive and are considered valuable gifts to them. The group has currently packed over 3,000 boxes in its short lifetime. The SSU group will be starting its fund-raising earlier this year, during a special Christmas in July event in Tracy Park where they will be hosting vendors of many types, as well as offering food and music. Adrienne Carver has been involved with Shawnee’s Operation Christmas Child since it first began three years ago and currently serves as president. Her ties to the organization go back seven years to her days of walking the halls at Portsmouth West High School, when teacher Tiffany Pistole organized the group at West. When Carver began college, Pistole also began teaching at SSU and the two started the Operation Christmas Child at Shawnee organization. All money raised will go directly into the group’s finances to purchase the supplies needed to give these children their special gifts. Any family-friendly vendor is invited to erect a table with only a $10 rental fee, which is how the organization is earning its money through the event. Informational booths are also allowed to be set-up for only $5. Current vendors include Origami Owl, Threads of Hope, Scentsy, Jamberry Nails, Pure Romance, Simplicity, Bears for Katelynn, Moonlighting Beaded Jewelery, various handmade craft vendors and more. Some vendors are also going above and beyond to assist the group, such as Diana Ulsh of Jamberry Nails. Ulsh posted on the event’s Facebook page that she will be donating 90 percent of her profit from any party planned during the event that falls within a time period. “Not only do you get amazing fashionable Jamberry Nail Wraps, you also get to support our Shawnee State students in their outreach ministry to children,” Ulsh said. The Christmas in July Craft Fair will be held by the Operation Christmas Child of SSU on Friday, July 17. The group will be setting up early in the morning and currently has no closing time. For more information, reach Adrienne Carver at 740-876-1786. “We are really looking forward to hosting these local vendors and entrepreneurs as they make a livelihood and we raise money to provide candy, toys, and the gospel to children all over the world,” Carver said.